We'd spent the night camped on the gasline road that runs between the Newberry and Rodman Mtns southeast of Barstow in the Mojave Desert. There was active work going on to add a new gas line that we discovered a few days earlier when we were hiking in the area, but we were out of their way where we'd parked. We'd come back to tag a couple of peaks we hadn't had time for on that earlier visit. Finding the point-to-point arrangement work so well the past few days, we did so again today, leaving the jeep at the finishing point on a spur road heading south from the gasline road, only a few miles from where we'd camped. We then piled into Jeff's truck and drove west and southwest on the gasline road to a point just before it drops into Kane Wash. This put as at the start of the Northwest Ridge of our first summit, unnamed Peak 3,952ft. 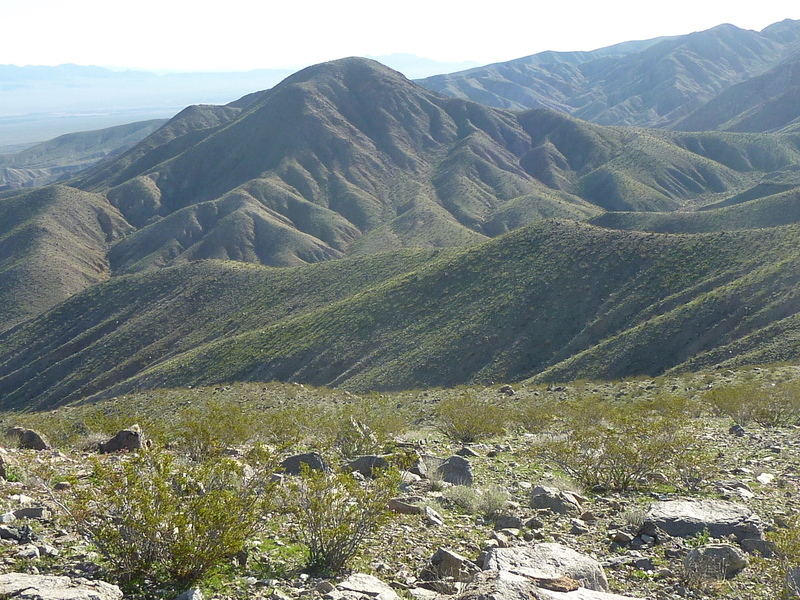 The ridge makes for a nice, moderate ascent, gaining 1,000ft in about 1.7mi. There is a good-sized boulder field to climb through initially, but the route grows more tame and quite enjoyable soon after, taking us about 45min to make our way to the summit. Jeff was out in front and making his way to another point to the north. I called for him to come back and join me at the correct summit (or at least the one that was indicated on my GPSr from LoJ) which he did, but as we waited for Karl I had to admit that the other point looked like a contender. After Karl joined us, we went over to check out the other point, finding it was 5-6ft lower based on differential GPSr readings. We left a register at the southern highpoint, dubbing it JaKoB Peak in fine Smatko style, using the initials of our first names. Our second summit, Peak 3,678ft, was about 1.5mi to the east, plainly visible across the intervening canyon. Our route was a bit out of the way to avoid losing so much elevation, but turned out to be a nice route. After descending the NE Ridge, we had a mile-long hike along a relatively flat mesa capped in dark lava rock originating from a small crater three miles to the south, Peak 4,906ft. There is a small cliff on the east side of the mesa that we needed to descend in order to reach the saddle with Peak 3,678ft. Luckily, we found a class 3 descent route through it, pretty much in line with the route to the saddle. As I started down through this break just behind Jeff, I was suddenly stopped when I spotted petroglyphs. They had been cut into the varnished lava rock facing east, many different figures in several locations. We found more as we descended and we took about five minutes to look around the area for more and to photograph the ones we found. We were careful not to disturb the petroglpyhs and avoided touching them on descent, but that didn't stop us from joking about doing so. We found more recent graffiti scratched in the rocks too, the oldest dated to 1901, but there were other names of more recent origin. We continued down the rough slope, making our way to the saddle and then up the South Ridge of Peak 3,678ft, gaining the summit shortly before 10a. There was a surveyor's wooden stick in a cairn with a few guy wires hanging loosely from the top. We took a second break here, perhaps 10min all told, before continuing east and northeast along a ridgeline descending down into the wash where the jeep had been left. We found an abundance of flowers in yellow and purple in the wash and along its banks before exiting the Wilderness a short distance from where we'd left the jeep. Finishing by 11a, Jeff and Karl decided they'd had enough for the day and would head home. We dropped Karl off at his car left where we'd camped, after which I drove Jeff back to retrieve his truck. For my part, I decided to continue southwest on the gasline road to tackle a few more peaks on my own before calling it a day. This minor summit is located about a mile southeast of the Newberry Mtns' highpoint. It is most easily accessed directly from the pipeline road to the south, starting almost due south of the summit where the road goes over a shoulder on the ridgeline. I drove almost an hour to reach this starting point, having to negotiate through 3-4 sections of the pipeline where crews were working on the new pipe. It's interesting that they keep the road open to the public, obviously something negotiated with the BLM whose land it runs through. The crews would have to stop working, move heavy equipment, and in one case, even flatten out the road where they'd pile dirt in order to allow passage. The hike itself took about 40min to reach the summit with a good view of the range highpoint, and just about as long for the return, all easy class 2. The peak was not far from the route we took to reach Birthday Peak two days earlier, and in hindsight this would have made a reasonable addition to that outing. I next drove out to Camp Rock Rd and then southeast for 5.5mi to a signed junction. I turned north and drove a few miles into the Rodman Mtns on a rough spur to its apex at a saddle between Peak 4,980ft and Camp BM. Karl and I had been up this road two years earlier to tag Camp BM. At the time, I had tried to talk Karl into the bonus peak on the west side of the saddle, Peak 4,980ft. He'd had enough by that time and we were both making the 7hr+ drive home that afternoon, so we left it. Today was the day to pick it up again. The easy hike starts off as cross-country, but joins with an old 4WD road for most of the way to the summit along the SW Ridge. There doesn't seem to be any traffic on this road any more, but it still appears useable. There is another road coming up from the south that may also work, but that seemed more involved to get to and I didn't give it much consideration. It took only 30min to reach the summit as it was, and just over an hour for the roundtrip effort. Back at Camp Rock Rd, I continued southeast on the good road that leads to a quarry at Peak 4,906ft. This is the same cinder cone that had spewed out the lava that we had traveled upon during our morning hike. Peak 5,240ft is found about 1.6mi south of the cinder cone and is easily reached from the good dirt road leading to the quarry. There are no turnouts available, but the road is wide enough to park along and still allow large trucks to pass. The approach from the west was short, about half a mile, all cross-country but fairly tame. The summit view is dominated by the much higher Rodman Mtns HP found only 1.5mi to the south. After returning to the jeep, I drove north to the quarry where I found the road gated. The summit of Peak 4,906ft was only half a mile away at this point and I considered hiking to it from the gate. But I noticed what looked like a caretaker's quarters on a hill to the left overlooking the property. There was a white truck parked there, giving me the impression that, even though the quarry itself was closed, there was likely someone at the residence to keep an eye on things. I decided not to take my chances and drove off.